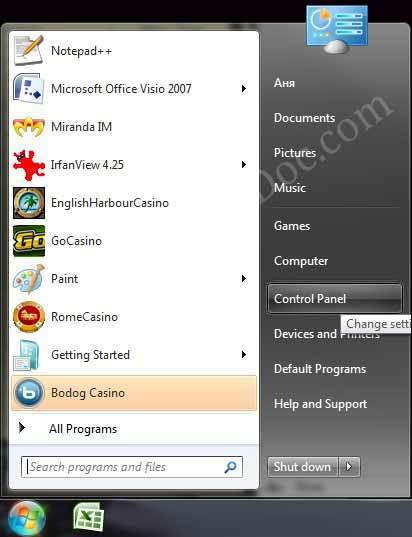 This guide will explain in detail how to uninstall the casino software from your computer. This process is very quick and will take only several minutes. Some casino players may delete online casino by clicking Delete button on your desktop but doing so they only delete a desktop icon, i.e. a shortcut to access the casino soft but the program itself remains in the computer. Deleting folder with the software won't delete all the files of the soft from your PC as they are stored not only at the location chosen by default or chosen by the player when installed but they can be found in various system folders. We remind you once again that you'd better not remove the casino soft by deleting the directory it is in. By doing so you will not delete the references to it in Windows. If you happened to delete the casino improperly and you want to delete all the references as well, you will have to reinstall the casino soft in the same directory it was before and then follow the steps given below. Before the removal, please close all running programs. The first step you need to take is to open the "Start" menu of your Windows desktop system. Computer operating system provides a mechanism that allows uninstalling the online casino software. In some versions of Windows the system may be a bit different, but it will not be difficult to accomplish uninstallment despite the slight deviation. In the Start menu find "Control Panel" and double click it. The Control Panel may also be accessed through Settings in the Start panel. In the Control Panel you need to double click the icon "Add or Remove Programs". This will show you all the programs that can be found on your computer. The next step is to find the casino program that you wish to uninstall and highlight it. When you click online casino to remove it, you can see the information that shows the size of the file and (depending on the Windows version) when it was last used. 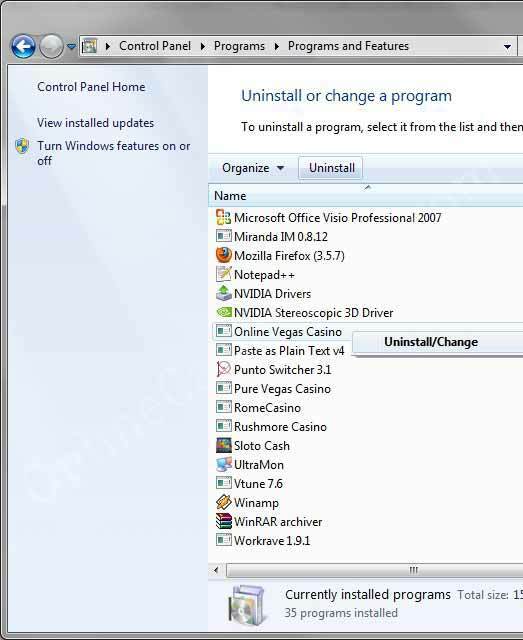 If you didn't change your mind to remove online casino software from your computer, click "Uninstall" and follow further onscreen instructions from your operating system to finish the removal. 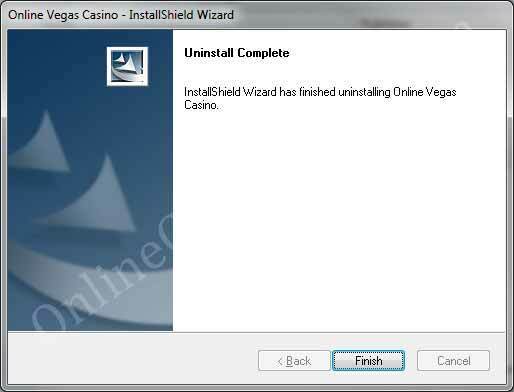 The player will be asked to confirm his decision to uninstall the casino but once he does that the software will be uninstalled. 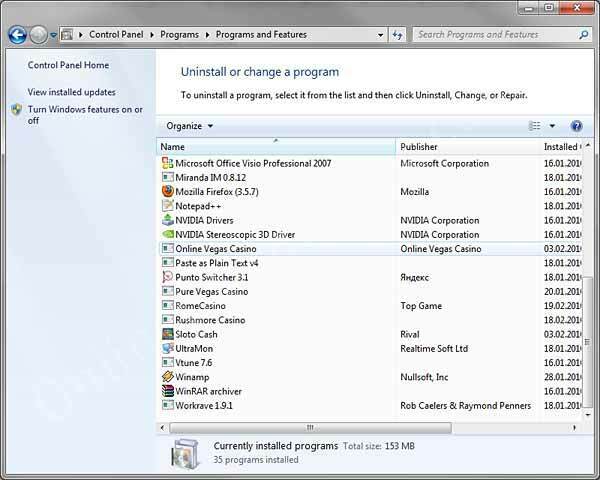 Uninstall will remove the Casino software from your PC, and you will no longer be able to access the Casino or your account from this machine. This doesn't mean that your account will be deleted, i.e. you can install the online casino software on any PC and play via your account.